Alpine Companies completes hundreds of Stamped concrete, pressed concrete and decorative concrete projects in a year. For a job to turn out this good takes proper time to add road base, full compaction with a concrete compactor, rebar, forming, concrete pumping, stamping, cleaning and sealing. This is another beautiful example of a stamped concrete sidewalk, back patio and steps by Alpine Companies. If you need a driveway, patio, steps, or front entry we can help. No one has more experience with stamped, decorative or patterned concrete in Denver, and not only do we stamp concrete but we can reseal and repair existing stamped concrete and make it look like new! Stamped concrete is the process of imprinting patterns in freshly installed concrete to create the look of higher-end finishes such as flagstone, tile, slate, brick or other patterns. The cost of a stamped concrete driveway, patio or sidewalk is generally lower in comparison to using flagstone, brick or other materials. Design. We have 30 years of experience selecting patterns and colors, and pictures of previous jobs to show you to make selecting a pattern for your stamped concrete project easy and fun. Patterns. 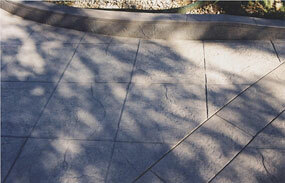 There are patterns for every shape and design of stamped concrete you can imagine. The most popular stamped concrete pattern is Ashlar slate, with brick and random stone patterns next. We’ll show you patterns that will be perfect for your home. Colors. Stamped concrete color hardeners increase the strength of the stamped concretes surface, and the colors are almost unlimited because many companies make custom colors. Integral Stamped Concrete. Integral colors in stamped concrete will fade overtime and not evenly; and it’s hard to repair because matching colors is almost impossible so we’ll make sure to show you that regular stamped concrete will hold up for years. Samples. We’ll make you a 2 foot square sample using the pattern and colors you’ve selected when you agree to have us do a stamped concrete job with us and there’s no charge and we’ll make you more than one sample if needed. Stamped Concrete is Extremely Durable. Stamped concrete is the most durable choice you can make for flatwork like driveways and patios and it’s easy to repair and a new seal job will make it look as new as the day it was stamped. Stamped Concrete Can Look Like Real Stone. Stamped concrete can fool a stone mason when it’s done properly, and it’s half the cost of real stone, and can be completed in days instead of weeks. Steel Rebar is a real necessity. In Denver, with our expansive soils, steel rebar is recommended and will add as much as $1.00 a square foot to the cost of your stamped concrete project. Stamped Concrete Thickness. The stamped concrete should be at least four inches thick; and six inch thick if you live in an area that has extremely expansive soils. Is stamped concrete slippery? All surfaces are slippery in the winter in Denver and will get ice on them; stamped concrete is no more slippery than all other surfaces you can use for driveways and patios. Sealing Stamped Concrete: Stamped concrete should be resealed every three or four years, and we’ll make sure to get the same colors and sealers that were used when the stamped concrete was installed if we didn’t do the job for you. Durability of Stamped Concrete. Stamped concrete can crack but they’re easily repaired with a mixture of the color harder and crack repair compounds that will stand up to all conditions and weather. Stamped Concrete Maintenance. Just use soap and water for spills and stains and they’ll clean up fast, and cracks if they should occur are easily repaired. 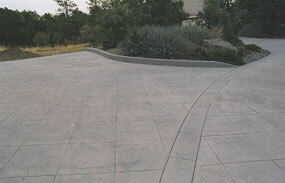 Imagine a your driveway in a beautiful stamped concrete pattern? It would surely make a strong impact for your home’s entry! Stamped concrete driveways typically cost around $10.00 to $12.00 a square foot. 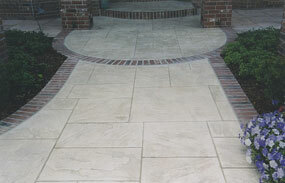 These borders are a beautiful addition to the perimeter of both stamped and standard concrete driveways and patios. 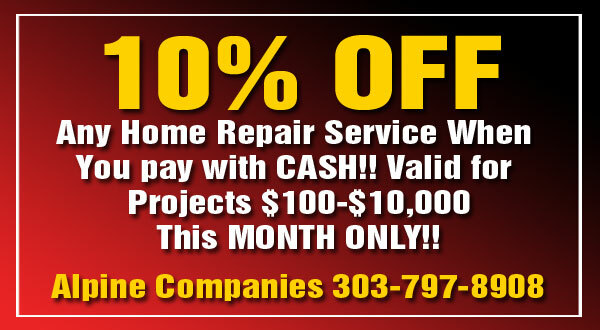 They typically add about $10.00 a lineal foot to the cost of most driveway and patio jobs. If you have a stamped concrete driveway that’s 60 feet long and 16 feet wide, that’s around 152 lineal feet at $10.00 a lineal foot additional cost. Both beautiful and functional, stamped concrete curbs can act as mini-retaining walls to retain moisture in your landscaping, keep bark chips, mulch and rocks confined to your flower beds (and not all over your yard!). Stamped concrete curbs cost around $15.00 a lineal foot. They look great when they are paired with a concrete driveway or patio. CONTACT us today for all your stamped concrete needs! Alpine Companies guarantees the highest quality stamped concrete at the best possible price!